Cherbow, K. & McNeill, K. L. (2018, March). Multimedia tools for supporting K-8 instruction in the NGSS science practices. Workshop presented at the annual conference of the National Science Teachers Association. Atlanta, GA.
González-Howard, M., McNeill, K. L. & Loper, S. (2018, March). Engaging in scientific argumentation: How do I support my students in articulating their reasoning? Workshop presented at the annual conference of the National Science Teachers Association. Atlanta, GA.
McNeill, K. L. & Meuse, E. (2017, May). Promoting student discourse. 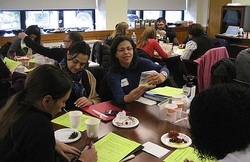 Workshop presented to the Boston Public Schools, Boston, MA. González-Howard, M., Pelletier, P. & McNeill, K. L. (2017, April). Learning to integrate science practices in k-12 classroom instruction. Workshop presented at the annual meeting of the National Science Teachers Association. Los Angeles, CA. Katsh-Singer, R. & McNeill, K. L. (2017, April). Assessment to support all students in the practices of science. Workshop presented at the annual meeting of the National Science Teachers Association. Los Angeles, CA. González-Howard, M., McNeill, K. L. & Loper, S. (2017, April). Argumentation toolkit: Resources for developing a classroom culture for scientific argumentation. Workshop presented at the annual meeting of the National Science Teachers Association. Los Angeles, CA. Marco-Bujosa, L. & McNeill, K. L. (2017, March). Introduction to argumentation, using evidence in a card sort. Workshop presented at the annual meeting of the National Science Teachers Association. Los Angeles, CA.